The world is ill-prepared for the threat of bio-terrorism, the head of Interpol has warned. Ron Noble told delegates at a two-day conference in the French city of Lyon that there is no "crime area where the police... have as little training". France called for an international monitoring centre to combat the threat. The international police organisation event aims to encourage intelligence agencies and police to co-operate more closely against the biological risk. Interpol says it is the world's first such conference. "The threat of bio-terrorism is real," Mr Noble told more than 400 delegates from at least 120 countries at the Interpol headquarters. "There is no criminal threat with greater potential danger to all countries, regions and people in the world than the threat of bio-terrorism," he said. Jackie Selebi, South African police chief and president of Interpol, cautioned that an attack on the food chain, for example by targeting livestock, was "not science fiction". "Major panic, temporary paralysis of government functions and private businesses and even civil disorder are all likely outcomes of a bio-terrorism attack," he said. French Interior Minister Dominique de Villepin called for efforts to improve the security of laboratories working with potentially dangerous substances, as well as a database to keep track of potential biological threats. The conference will include case studies of past incidents. 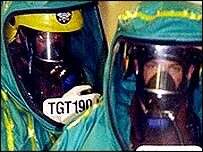 An anthrax scare shook the US in 2001, when five people were killed after attackers sent anthrax spores through the postal system.